Nottingham Road originally called Cromford Road, was the final stretch of the Cromford to Langley Mill Turnpike road built in 1766, although evidence suggests it existed long before then. The section leading up to Woodlinkin also had the name Field lane but this disappeared when it was converted to a duel carriage way in the 1930s. Fig.1 Nottingham Road 2013 This is a familiar view of Nottingham Road taken form just outside the French Horn public house (out of picture to the left). In the foreground to the right is the grassed area, which is now the location of the Mining Memorial but was originally the location of Niffens Row, demolished in about 1960. Also on the left can be seen the corner of the Severn Alms Houses. This picture in approximately the same position as Fig.1 was taken back in 1906. 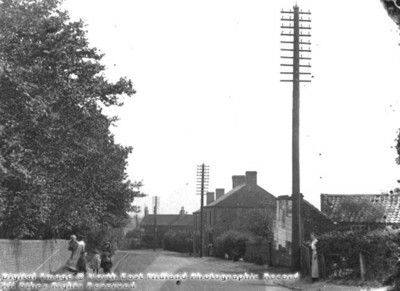 The wall on the left belongs to Hall Farm, demolished in 1963 and now the site of the French Horn public house. On the right of the picture can be seen some of the outbuildings that belonged to Niffens Row. Further down the road in the centre of the picture can be seen the old French Horn public house. Built during the 1920s and funded by Joseph Millot Severn and his brothers George and Franklin. More information click here. 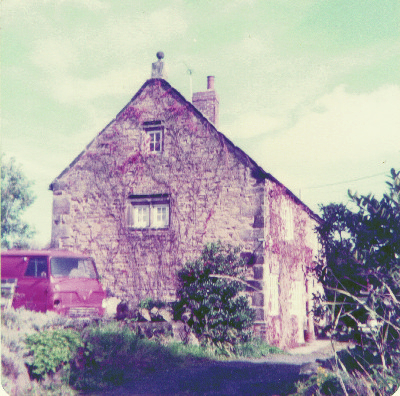 Fig.4 The oldest House in Codnor, built 1649, picture taken 1980. According to The Heritage of Codnor & Loscoe by Fred Thorpe, No. 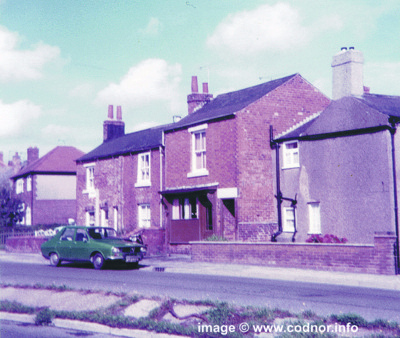 37 Nottingham Road was built by Robert Silcox from stone taken from Codnor Castle. The house also has an unusual sundial on the apex of the roof gable, which was reconditioned during the 1980s. At one time the house was thought to be a Coaching Inn. Fig.5 Robert Silcox initials R.S. 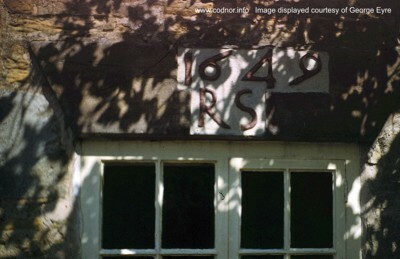 and date 1649 feature on a stone lintel on the building. 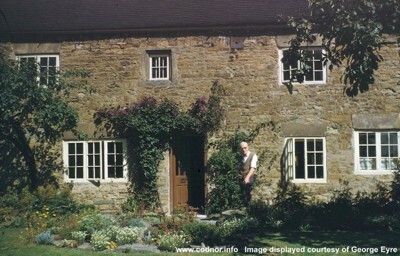 Fig.6 This picture taken by George Eyre during the late 1950s early 60s shows the owner, Tom Nicholson standing in the front Garden of No. 37 Nottingham Road. Tom was half brother to Ewan Walter Thorpe who lived to the grand old age of 104 years. Thomas Nicholson died in 1967. 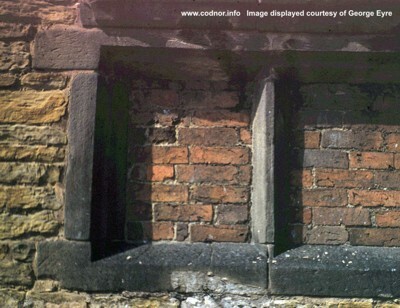 Fig.7 This window has been bricked up by a previous owner to avoid paying window tax, which was introduced in 1696. 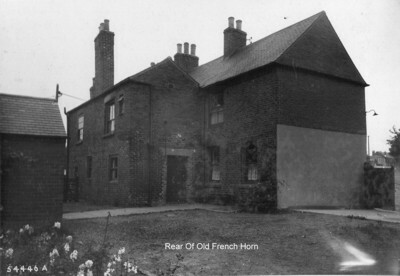 The original French Horn public house was situated on a plot of land on the opposite side of the road to the oldest house in Codnor. The pub faced up towards the Market Place, with a gravel area at the front. Fig.8 French Horn pub 1952, Landlord; James Lowe. Displayed Courtesy of Jack Bamford Jnr. Fig.9 Rear of the French Horn pub. 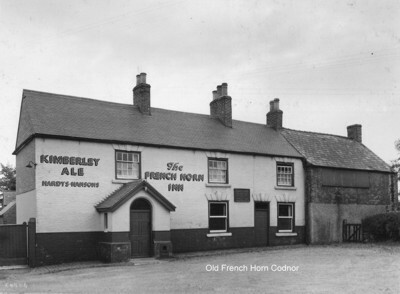 The French Horn was one of two Codnor pubs visited by the notorious Pentrich Revolutionists as they marched to Nottingham in 1817, the other pub being the Glass House Inn. 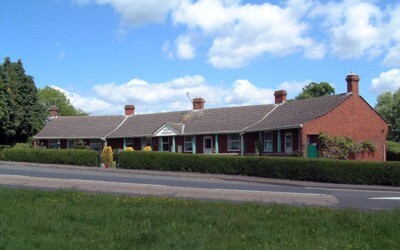 In Joseph Millot Severn’s book, ‘My Village’ he recalls his earliest remembrance of the Old French Horn was the refreshing smell of the brewing, also the performance of mountebanks and strolling players on the small bit of gravel ground in front, which was called the minion, because it was red, being made from the burnt shale of coal pit hills. Mr & Mrs Parkin to 23rd March 1964 then moved to the new French Horn premises on Codnor Market Place. The original French Horn was demolished soon after and a bungalow was built in its place, which incorporates a carved stone block built into the front wall depicting a French Horn. 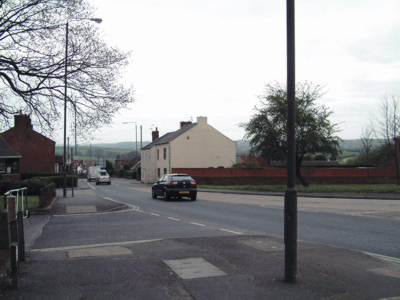 Fig.10 Further down Nottingham Road on the left was a grocers shop. This photograph was taken in the 1980s, long after it had closed as a shop and before the old shop front was removed. I am advised that George and Bertha Marriott were the last couple to run the shop as a going concern up until about 1956. Many Thanks to Jeff Marriott for the above information. THE VILLAGE APOTHECARY AND BAKER. Further along, in the shop, which was the only one down Nottingham Road below the French Horn, on the left nearing Daykins Row, lived Mr. and Mrs. Samuel Farnsworth, parents of Mr. Thomas Farnsworth, the chemist. A more typical country shop of the old-fashioned sort could scarcely be found. Mr. Farnsworth was a baker, grocer and apothecary, an odd mixture of trades and profession. It was an old-fashioned shop window, with groceries showing in the bottom part, and on the shelves above the usual globular bottles with large conical stoppers, containing green, red and blue liquid colourings, the old-time sign indicating the sale of drugs and medicaments; and inside were deep wooden bins containing flour, on the top of which were piled up loaves of bread. Mr. Farnsworth was a thin, spare man, of quiet demeanour. There was nothing aggressive in his unassuming nature. He had little to say, but one readily realised that he was a man of probity and philosophic understanding, dependable, as was everything he sold, and a helpful man to the needy. His wife was a real, early Victorian type of woman, and wore the grandmotherly caps and aprons of that period. She sometimes served in the shop or helped in the bakery. It is the people of this type who, without any pretension to ultra-goodness, have by their well-intentioned, kindly thought, industry and exemplary conduct, truly helped the old world to jog along, and, if only in a small measure, have left it better than they found it.